This past Saturday we had a family outing downtown to do some shopping, take care of some errands, and most importantly, go out to eat. We found ourselves in Jericho at the magic hour of noon, when – on weekends – one is faced with the delightful conundrum of whether one will go for brunch or for lunch. 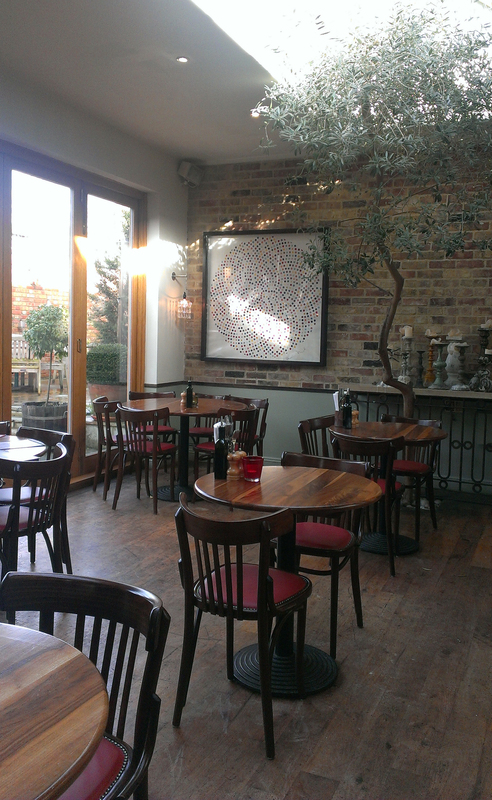 We chose Branca (111 Walton Street, OX2 6AJ), which had both brunch and lunch menus available simultaneously between 12 and 1. 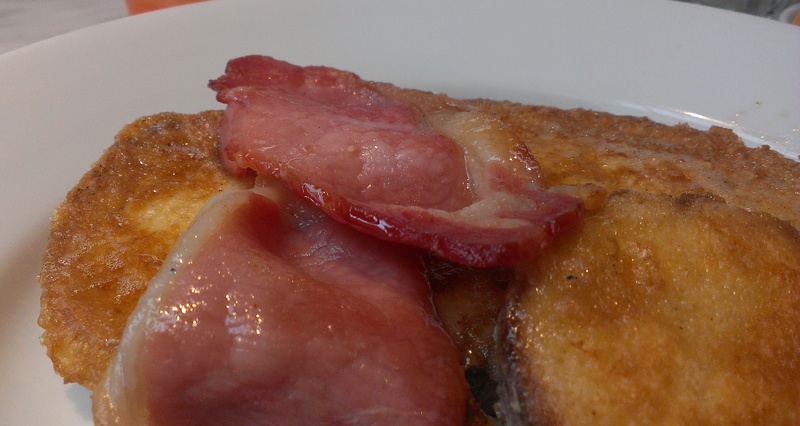 I was in the mood for French toast with maple syrup and smoked bacon (£4.95). The husband ordered the full breakfast (£7.45). 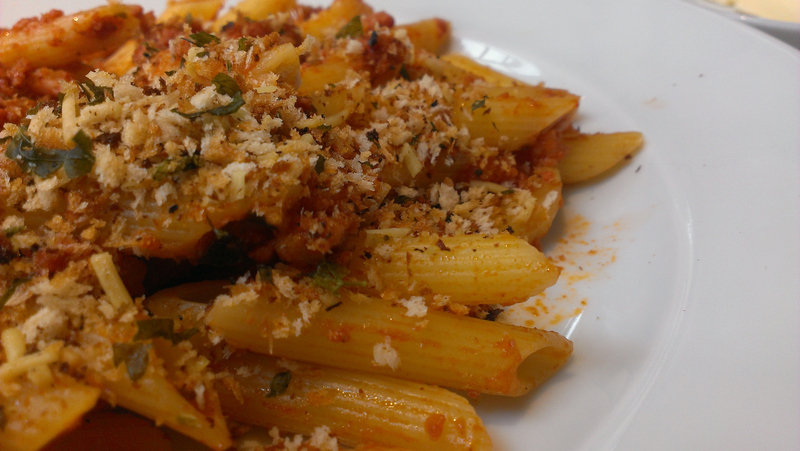 We looked briefly at the kids’ menu but decided to order the half-size penne with tomato and Tuscan sausage sauce (£7.65) for the Baberoo, since she has really been enjoying sausage lately (usually filching it from my plate). The penne arrived along with the full breakfast, but there was no sign of the French toast so I continued sipping my tea (China pai mu tan white, £2.40). The Baberoo started in on her pasta, but unfortunately it was woefully underdone to the point of crunchiness. We pulled out the ol’ backup snack bag for her and gave her some food from home, supplementing it with some of the full breakfast – which, according to my husband, was fine but not exceptional. My French toast seemed to have been forgotten, so we asked for it again and it arrived a few minutes later with apologies from the staff. The bacon was very good; the toast was also tasty and, fortunately, not too eggy (too eggy always ruins it for me) but I wanted more maple syrup to pour over it. What can I say? As a Canadian I believe that whenever maple syrup is part of a dish there ought to be a giant vat of it available for extra helpings. Menu: If you have only one hand available to eat while you hold a baby, the brunch menu has more options for you than the regular lunch menu. About half of the brunch menu is easy to eat with one hand; the lunch menu has a few good starters, salads, risotti, and pasta, but you’d be hard pressed to eat any of the meat mains using only one hand. Space: Branca is easy to get into with a pushchair, but there’s a bit of a bottleneck near the front where the bar juts out. Depending on how many people are waiting in that area, it may be hard to get past into the main dining space. The tables at the back of the restaurant are further apart than the ones near the front, so they’re definitely your best bet if you have a stroller. The first time I came to Branca there were five of us NCT buddies, all with prams, and we fit at the back just fine, and during this visit there were plenty of parents with strollers and/or young children. There’s a garden terrace with loads of space that is open in both colder and warmer months, if you prefer to sit outside. Ambiance: Light and airy, the place gives off an aura of being simultaneously cool and welcoming. There’s a tree growing at the back, and a lovely view of the garden terrace. The staff are friendly, and although we had to ask for a high chair (they are the nice Stokke Tripp Trapp ones) and a children’s menu, they were helpful with our requests (which makes me kick myself for not asking for more maple syrup). Facilities: The disabled/baby-change toilet at Branca is at the back of the ground floor, and although there are regular toilets downstairs sometimes customers use this one because it’s more conveniently located, so it’s quite busy. 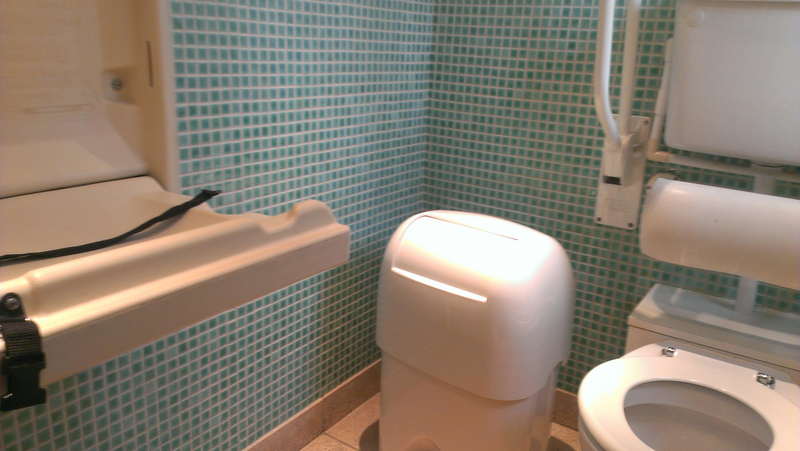 It is a lovely bathroom with a window giving lots of natural light, and it smells fresh and clean. The pull-down table is close to the door, where there is a hook to hang your diaper bag. The room is on the small side. I left the stroller at the table, but if I’d brought it in with us we’d have been rather cramped. Feeding: Although the Baberoo didn’t enjoy her pasta, Branca gets marks for having a children’s menu (mains range from £3.45 to £5.25) with a selection that has plenty of kid appeal. They also apparently have a baby menu, but although I asked for this I got the children’s one instead. If you were breastfeeding at Branca (which I have done in the past) you might find the chairs small and awkward; they have arms that curve right around so that if your baby is larger than infant-sized it might be hard to get into a comfortable position. There are a few cushy armchairs and sofas right at the front of the restaurant, but be warned: the front façade of the building is entirely glass so you’d be on display for passers-by to see. Bring a shawl or cover-up if you want to retain some privacy (nothing wrong with baring it all, though!). Overall Branca gets a 7.5 out of 10 for baby-friendliness. From the number of babies and children in the place, parents already know that this is a nice and spacious restaurant that is baby- and kid-friendly.